Run Simulation with Impulse Duration Set to Zero. This example shows how to use two different options for modeling S-parameters with the RF Blockset™ Circuit Envelope library. The Time-domain (rationalfit) technique creates an analytical rational model that approximates the whole range of the data. This is a preferable technique when a good fit could be achieved with a small number of poles. When the data has a lot of details or high level of noise, this model becomes large and slow to simulate. The frequency-domain technique is based on convolution, where the baseband impulse response depends on the simulation time step and the carrier frequency. An input envelope signal modeled with Simulink blocks. The input signal is a ramp that goes from 0 to 1 in TF_RAMP_TIME; the initial value of TF_RAMP_TIME is set to 1e-6 s. The carrier frequency of the signal is TF_FREQ; the initial value of TF_FREQ is set to 2.4e9 Hz. 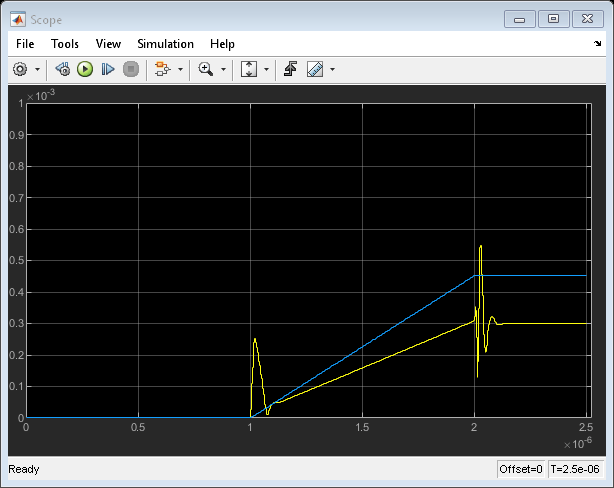 Two SAW filters, modeled by two S-parameter blocks using the same data file, sawfilter.s2p. The block labeled SAW Filter (time domain) has its Modeling options parameter in the Modeling tab set to Time domain (rationalfit). The block labeled SAW Filter (frequency domain) has its Modeling options parameter in the Modeling tab set to Frequency domain and the Automatically estimate impulse response duration is checked. A Scope block that displays the outputs of the two S-parameter blocks. Type open_system('simrfV2_sparam_t_vs_f') at the Command Window prompt. The outputs from both methods are very close to each other. The frequency-domain model (purple curve) captures the transfer function (steady-state value) a bit better. 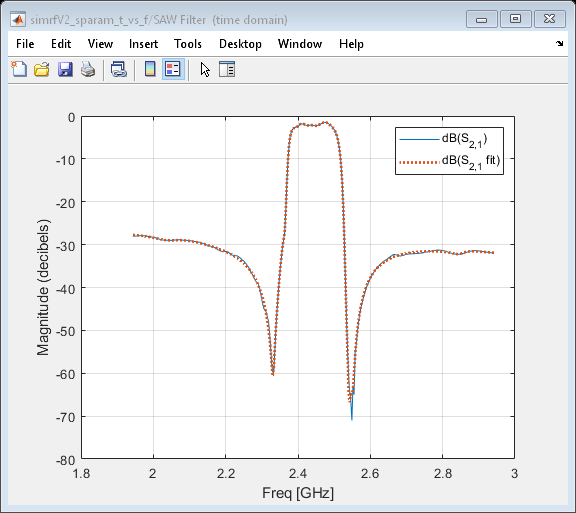 In the previous simulation, the rise time of the envelope TF_RAMP_TIME = 1e-6 was many orders of magnitude greater than the period of the carrier signal T = 1/TF_FREQ = 4.1667e-10. In other words, the envelope was much slower than the carrier. As the ramp time approaches the period of the carrier, the corresponding time effects are better captured by the time-domain model (yellow curve). Type TF_RAMP_TIME = 1e-9; TF_END_TIME = 1e-7; at the Command Window prompt. The result of the frequency-domain simulation can be improved by decreasing the time step of the simulation and manually setting the impulse duration time. Type TF_STEP = 5e-10; at the Command Window prompt. Uncheck Automatically estimate impulse response duration in the modeling pane of Saw filter (frequency domain) block and specify the Impulse Response Duration as 1e-7. Rational-function approximation is not exact. To see the approximation error, double-click the "SAW Filter (time domain)" block. Information about the approximation appears under "Rational fitting results" in the bottom of the dialog 'Modeling' pane. For more details, select 'Visualization' panel, and click the 'Plot' button. The rationalfit algorithm (dotted curve) does a very good job for the most of the frequencies. However, sometimes it does not capture the sharp changes of S-parameter data. Conversely, the frequency-domain method exactly reproduces the steady-state behavior at all carrier frequencies (by definition). 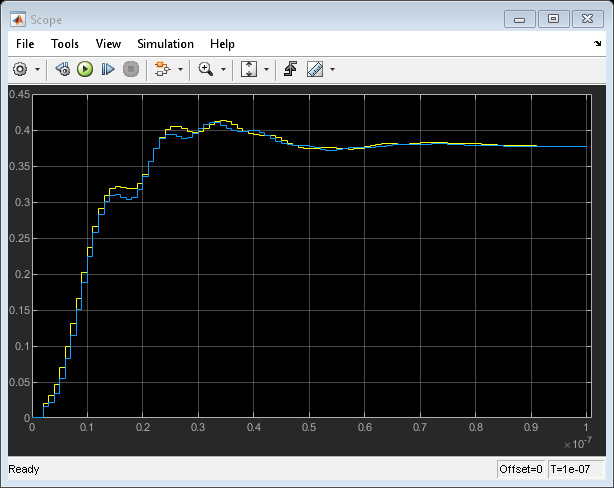 Running the simulation for TF_FREQ = 2.54e9 produces drastically different results between the two S-parameter methods. Type TF_FREQ = 2.54e9; TF_RAMP_TIME = 1e-6; TF_STEP = 3e-9; TF_END_TIME = 2.5e-6; at the Command Window prompt. In this case, the frequency-domain model provides a better approximation of the original data. There is a special case that could be very helpful in practice. When the "Impulse Response Duration" of the s-parameters block is set to zero, the history of the input is no longer taken into consideration. 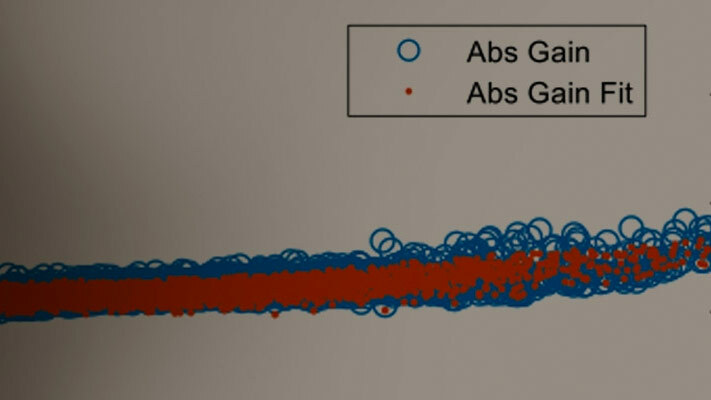 Still, the model captures the transfer function (steady-state value) correctly. This is a fast and reliable way to model the ideal devices when the transient effects could be ignored. Specify the Impulse Response Duration of Saw filter (frequency domain) block as 0. In most practical RF systems, time- and frequency-domain techniques give similar answers. The time-domain method better captures the time-domain effects of the fast-changing envelopes, but relies on a rationalfit approximation of the original data. The frequency-domain method is sensitive to the simulation time step; this option is recommended when the time-domain model does not provide a good fit.